One of the most significant books I got to work on in my time was Elizabeth Eisenstein’s The Printing Press as an Agent of Change. This 2-volume work was typeset in Cambridge, at the University Press, and printed and bound in in 1979 in America, at Halliday Lithograph Corporation. In those days the U.S. copyright laws mandated that, in order to retain copyright, books by American authors had to be printed in America. When a one-volume abridgment was published, The Printing Revolution in Early Modern Europe, in 1983, I was lucky enough to be the designer, as well as to shepherd it through the press. I confess the design doesn’t hold up anywhere near as well as the U.K. design of the 2-volume work. This one we typeset in America as well as printing it here. Both books are still available, though in paperback only: the big book as a 1-volume tome, and the second in a revised (redesigned) 2nd edition. Sentimentalist that I am I rather think that books of this nature, about the history of making books, should be published in hardback. Paperback (or Kindle, and both works are available both ways) just seem to casual. I do recommend reading the book (one or other, or both), though. 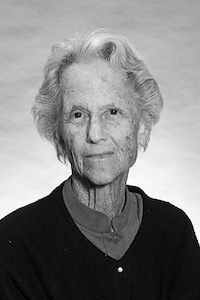 Elizabeth Eisenstein, now in her nineties, is interviewed here — click on the Listen button below the copy — on the 24 May, 2014 broadcast of Library Café, a Vassar College radio program hosted by Thomas Hill. She sounds great, and has a detailed discussion focussed on her most recent book Divine Art, Infernal Machine: The Reception of Printing in the West (UPenn, 2011). Check out the older podcasts: there are some interesting interviewees.